I’m just published Risuko, a young-adult/middle-grade historical adventure novel (whew! lots of qualifications on that!) set in Japan during the Civil War era, and I’m in the middle of writing Bright-Eyes, the second book in the series. And that’s me, at the moment. 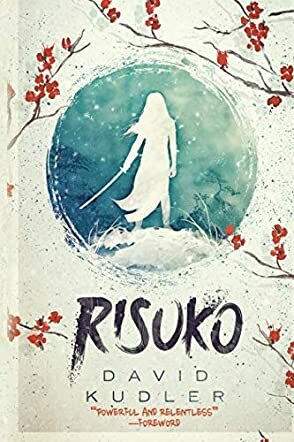 In David Kudler's Risuko: A Kunoichi Tale (Seasons of the Sword #1), which is set in Japan in the late 1500s, three orphan children and a girl who learns that her mother has sold her to a woman that she barely knows, are being transported to a school (the Full Moon) that teaches young girls to become "kunoichi". Risuko (Squirrel) has no idea what a kunoichi is. While still not even an initiate at the Full Moon, Risuko learns that the woman who took her away from her home and who runs the school wants her to become something that goes against all of her father's wishes. Meanwhile, a fox-spirit is lurking about, looking for something and getting more dangerous when it can't seem to find whatever it is looking for. As a protagonist, I absolutely loved Risuko, whose real name is Kano Murasaki. She has a knack for climbing anything, apparently no matter how high it is, without any amount of fear. Lady Chiyonne, who had shown up in Risuko's life one day to inform her that she has been sold, plays her role well as the heartless and highly respected woman who runs the Full Moon. Lieutenant Masugu of the Takeda army is there in the heat of battle when he needs to be, and is a major crush of not just Risuko, but of a white-haired girl named Fuyudori. The true identity of the fox-spirit is something that readers will find themselves scratching their heads about. I simply cannot get this book out of my mind. I have to read that sequel. A century of civil war has devastated Japan, but Kano Murasaki has grown up far from the conflicts and battles that rage in the nation. Nicknamed “Squirrel,” or Risuko, all the young girl wants to do is climb trees as she grows up in the Serenity Province. And yet, Risuko finds herself drawn into the war and handed responsibilities and expectations that she had never dreamed of when her innocuous hobby—tree-climbing—suddenly draws the attention of a powerful lady. Now, Risuko finds herself pulled into a realm where the stakes are higher and the world more complicated and deadly. While some in her community believe that she can “bring victory” and become “a very special kind of woman,” Risuko longs to return to the simplicity of her life before. And yet, she finds herself in the center of the conflict, with the power in her hands to either reunite the nation for good, or to destroy it entirely. In this YA historical novel set in Japan’s Sengoku period, a girl who adores climbing attends an unusual school. “Your mother sold you to me this morning.” With this, young Kano Murasaki, called Risuko (Squirrel) for her love of climbing, learns she’s to accompany imperious old Lady Chiyome’s palanquin. Risuko’s father was a samurai, a prestigious occupation in war-torn 16th-century Japan. After being disgraced, he had to find work as a scribe; he taught Risuko to read and write, but with him now dead, the family is near starving—and Risuko’s best option is to comply. The traveling party undergoes a cold and dangerous journey as it tries to dodge the fighting between rival warlords. Along the way, Risuko displays some of her abilities—not just climbing, but calligraphy, bird calls, and presence of mind when attacked. When they finally reach the Mochizuki compound, Risuko becomes a novice, believing that she’s being trained as a shrine attendant. There’s talk of initiates becoming kunoichi, which no one will explain: “you’ll just have to find out on your own.” At first, the novices perform only menial tasks, especially kitchen work, but they eventually receive lessons in music, singing, and dancing. But suspicion and intrigue (both political and romantic), plus attempted thievery and worse, tear apart the Mochizuki community, leading to a dramatic confrontation with the truth. Kudler (How Raven Brought Back the Light, 2014, etc.) draws on one of the most fascinating elements of Japan’s feudal period—the kunoichi, or female ninja. (Mochizuki Chiyome is a historical figure who trained young women as spies and assassins, using cover identities such as shrine attendants, servants, and prostitutes.) Also intriguing are the cultural details that Kudler weaves into his story, such as the Retreat, a small building where Mochizuki’s women stay during their periods. The characters are nicely varied and all the pieces fit into place deftly, such as how Risuko’s dance movements and kitchen skills can be used in fighting. A tight, exciting, and thoughtful first volume in what promises to be a fine series about a female ninja.